Watercress (Nasturtium officinalis) is a semi-aquatic perennial herb belonging to the family of Brassicaceae, which has been known since time immemorial for its flavoring, therapeutic and aphrodisiac properties. Watercress usually grows along the banks of slow-running streams and rivers in Europe, Asia and America. It is characterized by its small, round leaves, with a pungent, peppery flavor. The small white flowers appear in flat clusters are called corymbs. The fresh, tender leaves of watercress have to be harvested just before flowering, because after flowering they become bitter and are no longer good to eat. Watercress has a variety of uses, either as a flavoring herb or as a medicinal herb. In addition, watercress juice can be added to other vegetable juices to give them flavor and health benefits. Its main active principles are classified as thyoglycosides (glycosides containing sulfur)—an anti-thrombosis with a mild anti-coagulant effect. Watercress also contain moderate amounts of vitamins B1 and B2, zinc, copper and manganese. Watercress has plenty of health and therapeutic properties. However, due to its strong, pungent and bitter taste, it is never used alone, but is always added to juices, salads or other dishes as an ingredient, flavor or garnish. Antioxidant and anticancer effects: Just as many other herbs, watercress is rich in antioxidants. Anti-oxidant substances help prevent or fight the damage caused by free radicals to body tissues, thereby contributing to prevent premature aging, as well as lower the risk of developing cancer and many other chronic or degenerative diseases. The sulphur glycosides in watercress makes it an effective expectorant. Watercress has been found to be useful for loosening mucus caused by cold, and getting rid of phlegm that causes cough. Other related respiratory ailments that might benefit from watercress are asthma and emphysema. 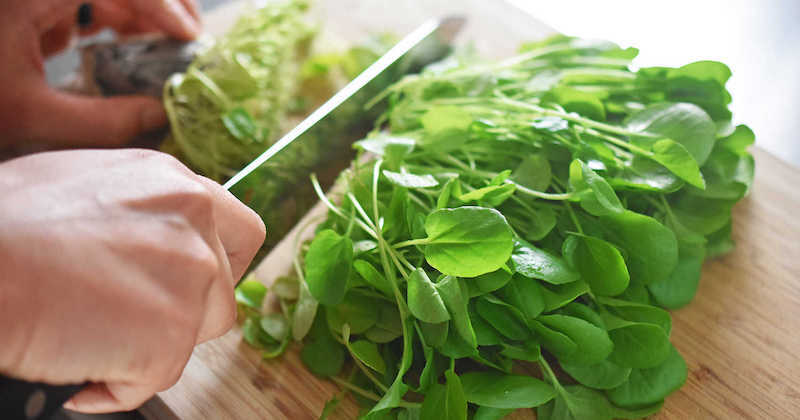 When consumed by individuals already suffering from a cold or cough, watercress helps shorten the duration of the ailment and reduce its intensity. When consumed at the first symptom, it helps prevent it from becoming a full-blown infection. Eat about an ounce of fresh watercress each time, 2 or 3 times a day. Boil a bunch of watercress (a bundle as you buy it from the grocery) in a stainless steel pot with water just enough to cover the herb, for about 5 minutes. Let cool a little and drink warm throughout the day. Juice a bunch of watercress with 2 or 3 carrots and ½-inch ginger. Drink till mucus/phlegm is gone. Watercress can be used as a basic ingredient for salads (using the leaves), sauces, or in soups. Watercress juice can be added to a variety of vegetable juices, to give them flavor and health benefits. On its own, watercress juice is very strong and bitter. Like wheatgrass which is very potent, do not take more than two ounces of this concentrated green juice each time, mix it with other juices to make it more palatable and easy on the stomach. It blends very well with juices of carrot, potato, spinach and turnip leaves. Throw in some parsley too for their synergistic healing power. Squeeze in half a lemon to reduce its pungent taste. The Chinese people like to boil watercress soup (with ingredients like dates, carrots, ginseng, gojiberries, black pepper, ginger, etc.). No doubt some nutrients are destroyed in the heat; phytonutrients cannot be destroyed but will leach into the soup. Discard the leaves. People suffering from bladder inflammation may want to avoid or limit the consumption of watercress, due to its possible bladder pain-inducing effects. People with hyperthyroidism may also want to limit watercress consumption due to its high content in iodine. 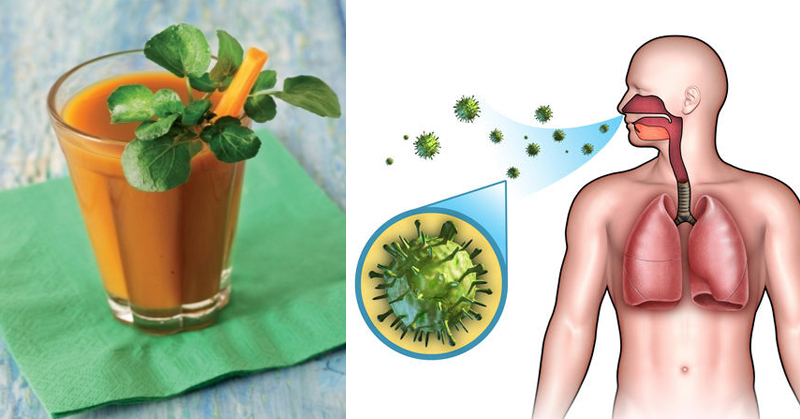 If you are on medication, you might want to consult with your doctor before eating watercress or drinking its juice. Watercress is so wonderfully potent in all its goodness that it may react with the drugs you’re taking. Hi Esi, congratulations with the baby!! Yes, it’s completely safe to drink one or two glasses of juice a day when pregnant. Juices are rich in nutrients that go to nourish your baby as well. Drinking fresh juices is one of the best things you can do for your baby.